I had the opportunity earlier this week to take a look at Kill Team – the new skirmish wargame from Games Workshop, set in the Warhammer 40,000 universe – when I went to Boards & Swords Hobbies in Derby. As you may be aware, whilst I used to be a fully paid-up member of the GW fan club, it has been many years since I have played anything from this company – with the notable exception of Space Hulk. In the last couple of years GW seem to be intent of turning their fortunes around with a dazzling amount of new games and products – something that has been achieved, if their latest financial results are to be believed. The concept of Kill Team has been around for a few editions of W40K now – it’s been seen in the main rulebook as a different way of playing the game. However, I believe that this is the first time that it has been released as a game in its own right, rather than just a sub-section of the larger Warhammer 40K rules. As you are probably aware, Kill team is a skirmish wargame. Think of it as W40K on a budget, or (probably more accurately) Necromunda for all the armies in the W40K universe, rather than a few gangs on a single planet. The model count for a game is intended to be something like 5-10 per side. Whilst the 208-page soft back Core Rulebook contains all you need to play the game (and indeed, is available to purchase separately for those gamers who already have models & scenery) the boxed game comes with a huge amount of ‘stuff’, including a large amount of plastic scenery, 20 models, a double-sided 20” x 30” playing board, the aforementioned rulebook, plus cards decks, tokens, dice and a measuring stick. Expansion packs include models for a particular Kill Team, plus required cards and additional themed scenery, and seem very reasonably priced. There are a number of changes to ‘standard’ W40K, or least from what I remember 40K to be. Each force has a number of Command Cards available to them – these are increased by using Specialists in your force. These Command Cards can be played during your turn to provide advantages at key point in the combat. The turn sequence has been amended slightly, so that whilst the movement phase is still I-GO-U-GO, based on an initiative role, the combat phases (psychic, shooting, fight) follow an alternate-model activation sequence, so the game is not decided upon by the initiative role. As I said, a lot to like. If that is the case, then why are my own feelings toward the game so apathetic. The problem is a simple one – although everything bright, shiny and new, I have a distinct feeling of deja vu and I think Kill Team suffers badly from a case of “Emperor’s new clothes” (pun intended). Perhaps this is intentional. Indeed many people when describing the game have invoked the name of Rogue Trader in their descriptions. Maybe this is due to the diversity of factions in the game, or the background idea of small elite forces fighting secret missions. Whilst it may be true of the ‘fluff’ behind Kill Team, for me the game mechanics harp back to the original Necromunda game. OK, there are a couple of extra bells and whistles, but the basic rules that we were playing in Necromunda are still on show here, right down to models potentially suffering flesh wounds rather than being killed when hit. Necromunda was based on 2nd Edition Warhammer 40,000, and was published in 1995. The game mechanics we see in Kill Team are still the same – and in my opinion age has been less than kind. Compared to the more streamlined mechanics of modern games, I found combat – which, lets face it, is the meat of most games – to be a laborious dice fest. With the addition of ‘Flesh Wounds’ a total of four dice rolls are now required for each and every combat to fully resolve it. Roll to Hit, Roll to Wound, Roll to Save and Roll for Wound Effect. Our experience when we played was that the majority of these dice interactions ended in no effect being had. Yes there are a few changes – thank goodness the old Strength vs toughness matrix has been replaced by one simple effect table – but on the whole I was less than impressed. Though I liked Necromunda when it came out – indeed it was one of my favourite games for a while – I have since moved on, finding newer games with better mechanics. Kill Team took me back over 20 years, but not in a good way. 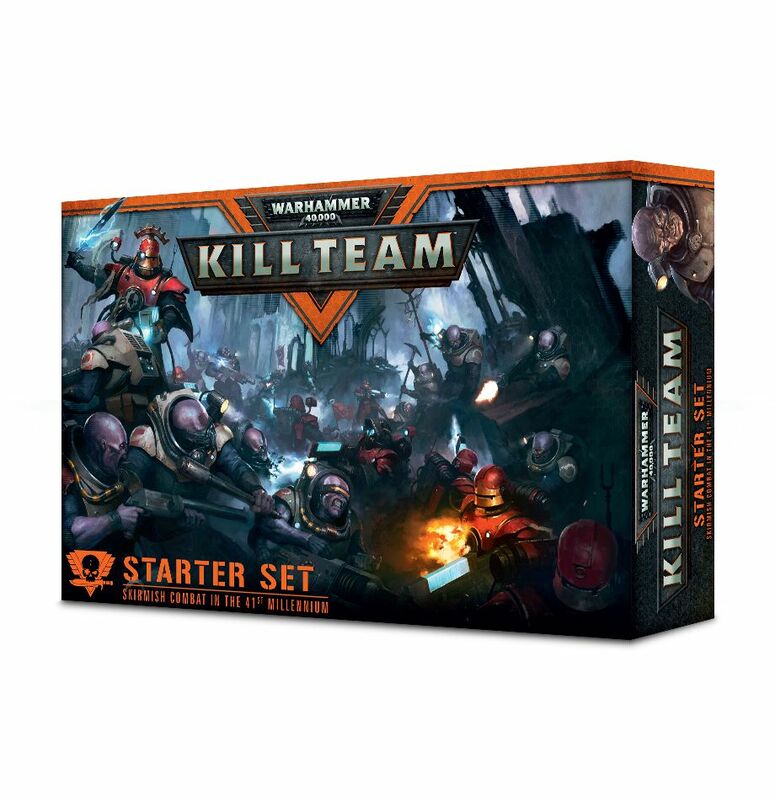 Now I know that Kill Team is designed the way it is for very good reason – it is Warhammer 40,000 after all – so anyone who plays 40K will pick up and play this game with little or no trouble. Indeed, it now provides a budget gateway into W40K, so that gamers on a budget, or those new to the hobby, can spend what is the average price for a large boardgame with miniatures these days, be up and playing a game and then be drawn into the larger 40K universe – after all, that is what happened to me all those years ago after I bought Space Hulk. Investigating Space Marine Terminators led me to 40K and the rest is history. There is no doubt that Kill Team is an excellent product. I was initially excited to see it, and I was certainly considering this as a purchase, if I enjoyed the game. However, what I instead discovered is that with one notable exception, I think I am done with 40K. I have after all been there, done it, drunk deep of the cool-aid, bought (several) T-Shirts and then moved on to other things. One thing is certain, if you like W40K, I think you will love Kill Team. It’s not Kill Team, It’s me. Thanks for the well thought-out review, much appreciated. Fair comments. My son’s arent done with 40k yet as they had such a long break.from 5th to 8th and love the fluff. Gives me an excuse to paint unfinished stuff though. Thanks Neil. Never played GW stuff, but now I really will put their games on the back burner. I confess it is drawing me back in. I can find a use for the odd few figures I’ve got floating around that would never make a 40K army. Sadly, it is incredibly hard to get local gamers to try other systems, so if it is the only game in town… and the fluff is enjoyably silly. I hear you regarding the dice rolls and rolls and rolls… I found that particular aspect irritating within minutes. The turn/action sequence is novel but still feels clumsy relative to many systems that aren’t constrained by their legacy. That being said, the depth of the lore that’s reflected in the game just can’t be beat by any other franchise that I can think of. Agreed with ref. to the lore of the game – you can’t substitute 30 years of background material!